To say that the ski season has been an utter disaster would be an understatement of epic proportions much like saying the Seahawks gave away the Superbowl. So what we are left with are bare and rocky mountain peaks in our supposed "Winter" (I guess Al Gore was onto something...). 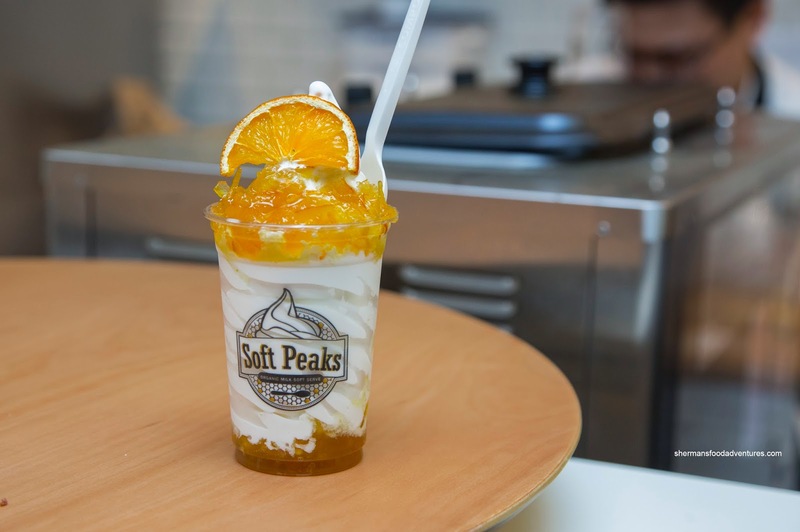 But there is one way to get some frosty peaks in Vancouver - at the newly opened Soft Peaks in Gastown. No, that doesn't solve the crappy ski season, but at the very least, one can drown their sorrows in premium soft-serve made with organic Avalon milk. 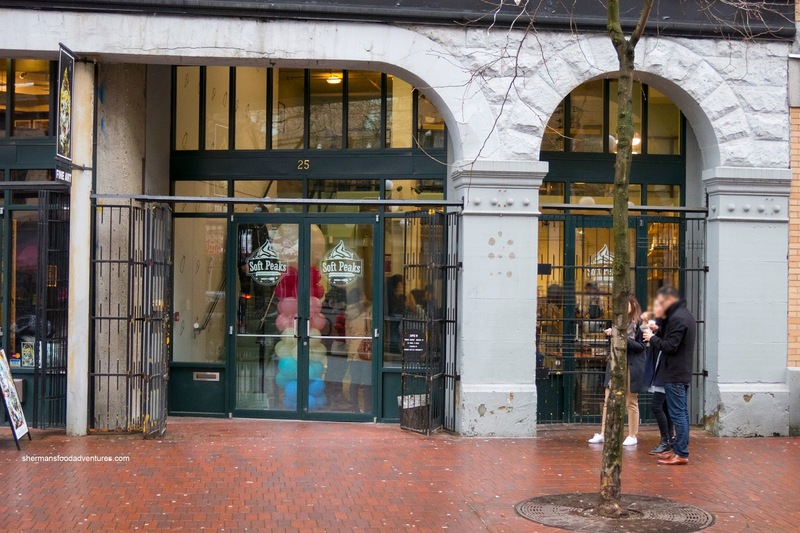 I ended up visiting the place 2 times with the first being comped and the second on my own dime (hey, kinda hard to write a blog post with only 2 items...). On our first go-around, we tried the Mudslide and Sunrise in California, both in the large size. Topped with Tim Tam flakes and chocolate syrup (and on the bottom as well), the Mudslide was chocolaty in a milky sweet manner. Now the sweetness didn't actually come from the soft serve. In fact, it was bordering on bland. But that is the beauty of Soft Peaks. With already a bevy of sweet ingredients, there is no need for an overly sweet ice cream. 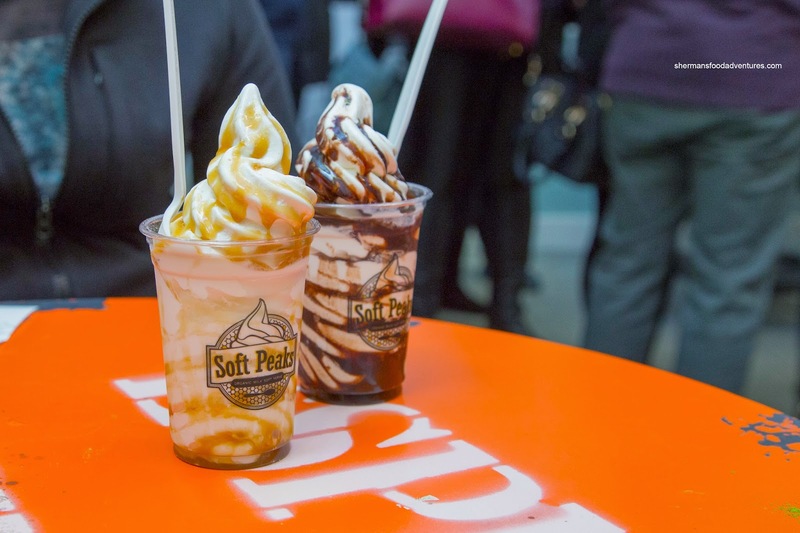 About that soft serve, it was creamy, rich and had a fairly dense consistency. With a sweet and sour yuzu marmalade, the Sunrise was "lighter" in a tangy sweet manner. The marmalade was pretty sweet, but again, the neutral-tasting soft-serve did not add to the sugar content. Returning the very next day, we encountered a lineup that went down the block. This is an example of successful social media. 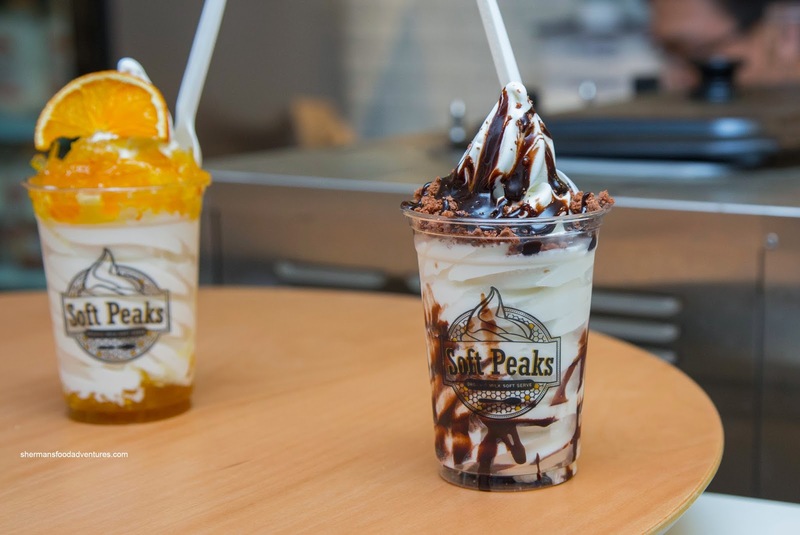 After 45 minutes, we received our order of their signature item being the Honeycomb Peak and the Asian-inspired Green Forest, both in small. 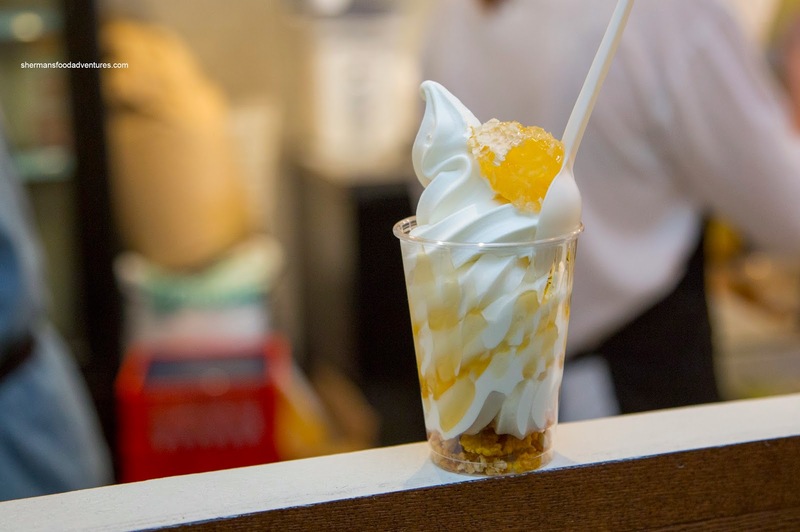 Simply accented by a large piece of local honeycomb and drizzled with honey, the Honeycomb Peak allowed the soft-serve to shine on its own with only a touch of sweetness. However, the honeycomb was super sweet and sticky (since it was chilled by the ice cream). 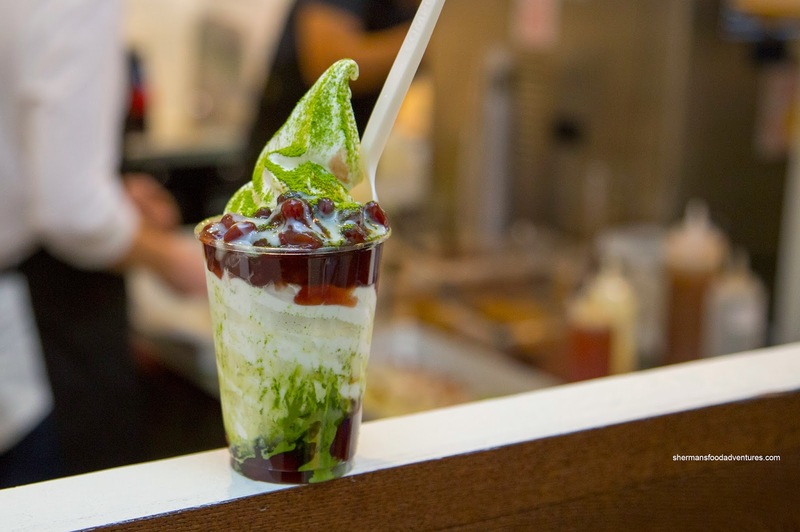 The Green Forest consisted of sweet red bean, condensed milk and organic matcha powder. Naturally, it had some elements of a Chinese "hong dau sa", where it was pretty sweet due to the condensed milk. There was some aromatics from the matcha powder, but the condensed milk did overwhelm everything. I returned once again with Sean to try the Salty Himalayan in both versions - chocolate and caramel. Since the salt was sprinkled on top, the initial bites were pretty strong. Interestingly, we thought that the salt worked better with the chocolate rather than the caramel (Sean takes credit for this one). So, after these 3 visits, it is pretty to clear to me that their soft-serve is on point in terms of texture and taste (not too sweet). As for the toppings, they are purely subjective. The only thing that gives me pause is the price as it ain't cheap. But one must consider they are located in Downtown and are using organic Avalon milk and other quality ingredients.